L-R Imogen Manning; Alan Jones; David Hall and Greg Miller. In October we held Crowe Morgan Valkyrs Hockey Club's annual Mhelliah to raise funds. Every year the committee and I like to choose a charity or good cause in the west of the Island where we are based to benefit from some of the money raised. This year we decided that we would like to help contribute towards the Christmas Party for the residents of the Westlands Sheltered Housing Complex. We at Valkyrs thought it would be nice to give some back to a generation that have done so much for the community that we represent. 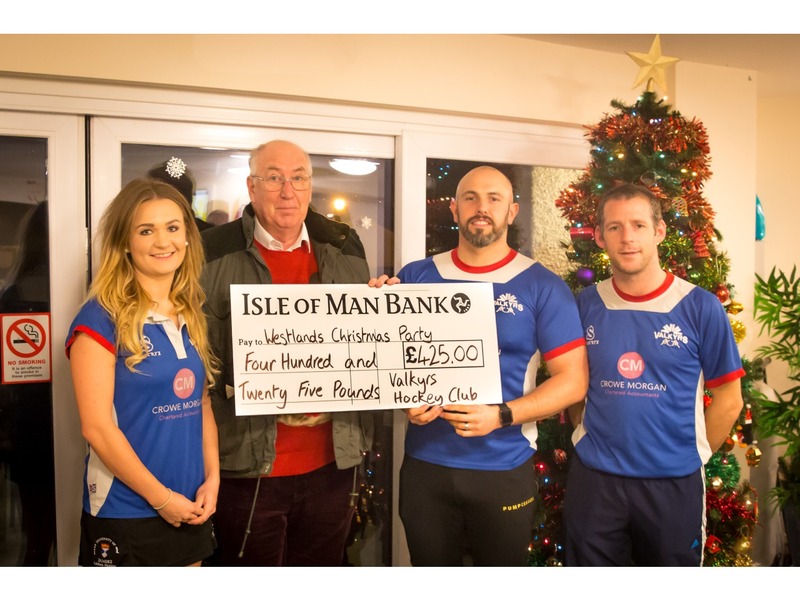 On Wednesday 14th December 2016 part of the Valkyrs HC committee attended the Westlands Christmas Party for approximately 50 of the residents and presented a cheque for £425 to the Head of the Peel and Western District Housing Committee, Alan Jones. Crowe Morgan Valkyrs Hockey Club would like to thank everyone who attended the Mhelliah and supported the Club; without you we couldn't continue to support our local community and provide a sporting environment for family and friends of Hockey.